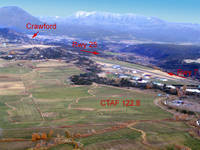 Our privately owned, public accessible air park (99V) is located just west of the town of Crawford on Colorado Highway 92. For flight plan purposes, we are 17 nm northeast of Montrose, Colorado with 4900x40 foot asphalt paved runway, 2% downward slope to west and 6,470 ft elevation. Runway is non-standard lit with VASI for local operators only. PPR for others at night. 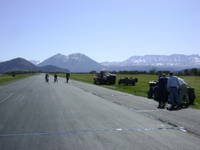 We also have a 2500x125 foot grass parallel runway, but with check with local operators before using. A low pass is suggested before any landing to check for grazing deer on the runway borders. CTAF 122.8 is commonly monitored during the day. Check local NOTAMS for aerobatic box activity and glider operations. To preserve privacy, each homeowner can select what albums and folders are shown publicly, or can arrange for guest logins and viewing selected albums or photos. 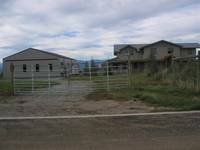 Contact the homeowner or Rob Duncan, webmaster, for details. 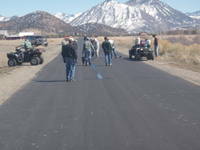 Eight neighbors getting together to tar, but no feathering, the runways cracks. We own the tar heating machine and this is an annual event, punctuated by a great home-spun lunch. Created on 05/02/13, last changed on 05/02/13. This album contains 7 items. This album has been viewed 2375 times since 05/02/13. Created on 03/13/12, last changed on 03/13/12. This album contains 9 items. This album has been viewed 3181 times since 03/13/12. This album has a lengthy description about the history of our airpark which began in the early 70's and now has about 20 residents. Created on 12/31/10, last changed on 01/01/11. This album contains 8 items. This album has been viewed 5873 times since 12/31/10. Created on 01/07/08, last changed on 11/25/09. This album contains 3 items. This album has been viewed 4590 times since 01/07/08. This public album contains photos and videos of various guests and their aircraft. It also includes photos taken during our annual open house with local EAA and custom auto clubs. Created on 10/02/08, last changed on 05/19/11. This album contains 37 items. This album has been viewed 4613 times since 10/02/08.